Welcome back to the Ottobock Fireside Chats web-series. 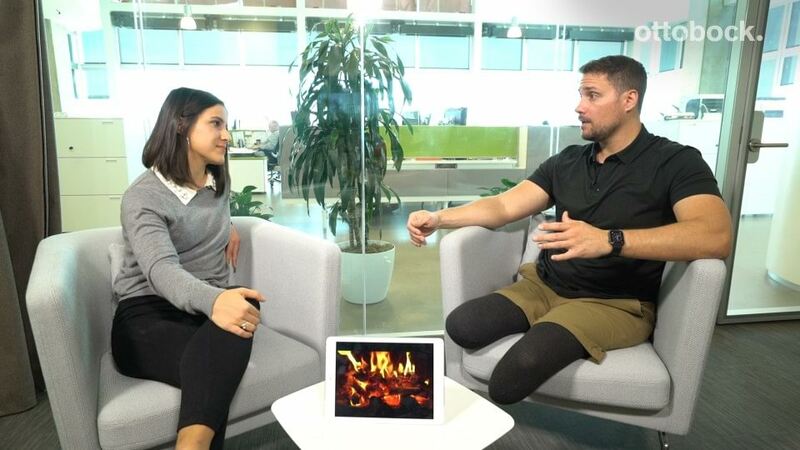 Watch Part 1 of host Lacey Henderson’s interview with Craig Towler and keep an eye out for upcoming Fireside Chats and updates from Ottobock. Craig Towler shares his story of persistence and positivity by embracing the journey of transition. Just over a year and a half ago, on the Fourth of July, Craig Towler’s life changed forever. In the morning, Craig attended 5k and 10k races in the early morning with his work. The races were fun, but took most of the day, and Craig was looking forward to relaxing, eating barbecue, and celebrating. He got home and started to unload items from his car when things took a drastic turn: he was hit by a vehicle and pushed into the back of his car. Shocked and stunned, he looked down and realized that both of his legs were disconnected from his body. Miraculously, he was fully conscious and aware of his surroundings. To this day, he remembers very vividly what happened. Later, he discovered that a distracted and impaired driver swerved off the road, hit another car, which hurtled forward and crushed Craig between the two cars’ bumpers. Fortunately, since it was the Fourth of July and a lot of people were around, he was able to yell for help and get an ambulance. He was sitting on the back of his car with his legs hanging down. People helped lower him to the ground. He was bleeding profusely and realized that if the bleeding didn’t stop quickly, he would die. So, he asked anyone within hearing distance to take whatever they could – belts, shoe laces, anything – that could be used as makeshift tourniquets to stem the bleeding and buy some time. He even told them, “Tie them as tight as you can, even if I’m screaming.” Later, he learned from his surgeons that those tourniquets helped save his life. At the hospital, the surgeon told him that both lower portions of his legs would have to be amputated. He had numerous surgeries to ensure that upward mobility would be possible in his future. Due to a skin graft, the healing process was a much slower process than expected. An initial recovery goal was to stand at his best friend’s wedding a few months after the accident. Unfortunately, this goal was not reached, but Craig realized that these events are part of the healing process and shouldn’t be considered a setback. Now, his mission is to help others heal from life-altering events and embrace the journey.